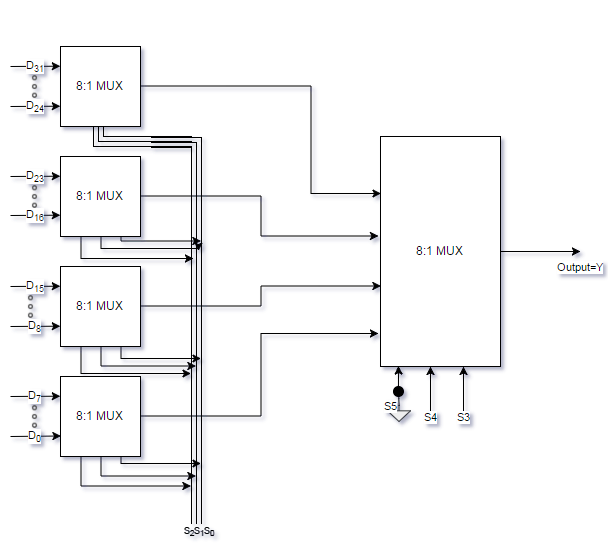 Question: What is multiplexer tree? Construct 32:1 multiplexer using 8:1 multiplexer only. Explain how the logic on particular data line is steered to the output in this design with example. Q. What is multiplexer tree? Construct 32:1 multiplexer using 8:1 multiplexer only. Explain how the logic on particular data line is steered to the output in this design with example. A number of m-to-1 multiplexers can be arranged in a tree topology to obtain a bigger n-to-1 multiplexer is called Multiplexer Tree where n>m. 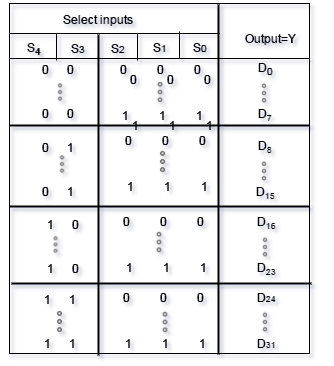 Bigger Multiplexer can be obtained by combining smaller Multiplexers.